Though many providers have been able to reduce the number of advanced visualization (AV) vendors in use within their organizations, consolidation onto one platform for all applications is not yet a reality. Providers keep multiple systems in order to meet differing physician preferences and retain specialized functionality while also taking advantage of some of the more automated AV software included in their PACS and imaging equipment purchases. In this report, KLAS targeted providers who have a server-based, enterprise-wide approach to AV to discover whether viable consolidation options exist, who providers consider as they expand their use of AV, and the factors in addition to functionality—such as training and server experience—that affect provider success. The GE Healthcare and Philips systems are the AV solutions most widely adopted across clinical areas. The broad functionality they offer meets many needs for many types of users. In addition to offering broad functionality, Philips provides satisfactory relationships, schedules regular follow-up training, and consistently upgrades the system to address customer concerns. GE Healthcare customers also receive consistent upgrades, though these upgrades sometimes have glitches or don’t implement all needed fixes. 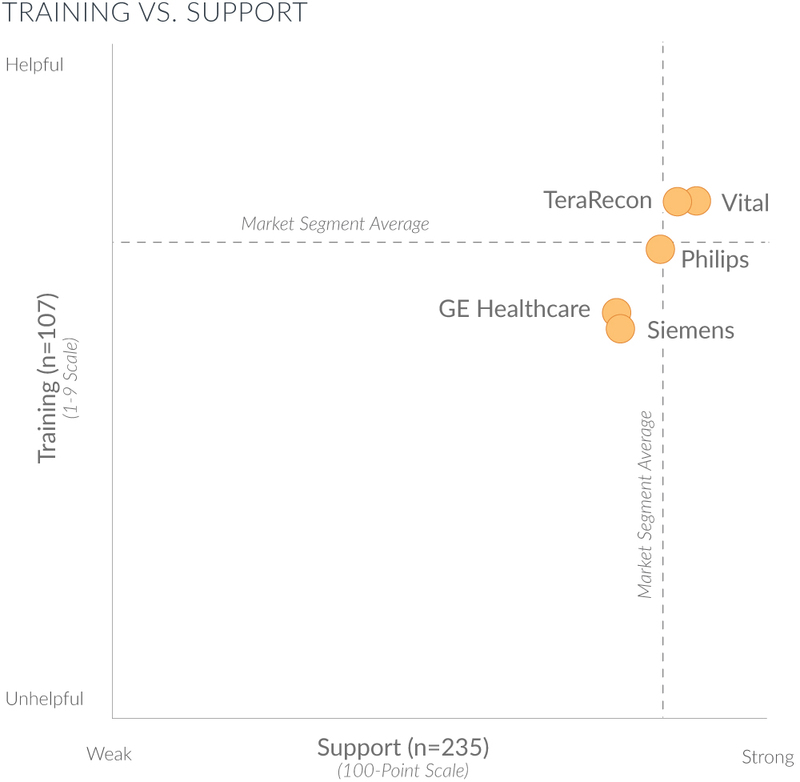 GE Healthcare customers report a lower level of satisfaction with training and support than Philips customers do. Few Siemens customers report plans to expand their use of Siemens' AV solution. They regard the technology as difficult to use and say it has not been given hoped-for product development. TeraRecon also has a lower percentage of customers planning to extend the system to additional clinical areas. TeraRecon's strength is cardiology, and the solution lacks significant adoption outside this area. However, no TeraRecon customers report plans to decrease use, with one reason being the system's strong reporting and data analytics. Vital is another more narrowly adopted vendor, though more of their customers have plans to expand. They cite the system's ease of use as a particular strength. The AV users targeted by this research report that a server-based, enterprise-wide approach is one of the keys to their success as it eliminates the problem of workstation bottlenecks. While all vendors in this report offer a server-based option, the value users feel they get from a server-based option can be lessened by things such as poor system speed or a nickel-and-diming pricing structure. Some Siemens users report slow processing speeds, and in addition, Siemens' per-license cost leaves customers feeling that they have been nickel-and-dimed and haven’t gotten their money's worth. Vital customers, who pay per user, experience consistently good system speeds, as do customers of TeraRecon. Philips' server package includes unlimited licenses, and system speed has not been a problem. GE Healthcare's server is easily navigated and has high uptime. The complexity inherent in advanced visualization means that success with and adoption of an AV system can depend heavily on the quality of the training users receive. TeraRecon's thorough training enables customers to be successful and achieve deep adoption in cardiology. The physician focus of Vital's training empowers users to adopt the system. Philips' system has an easy GUI, and customers receive follow-up training via phone; a few would like more of that training to occur in person. 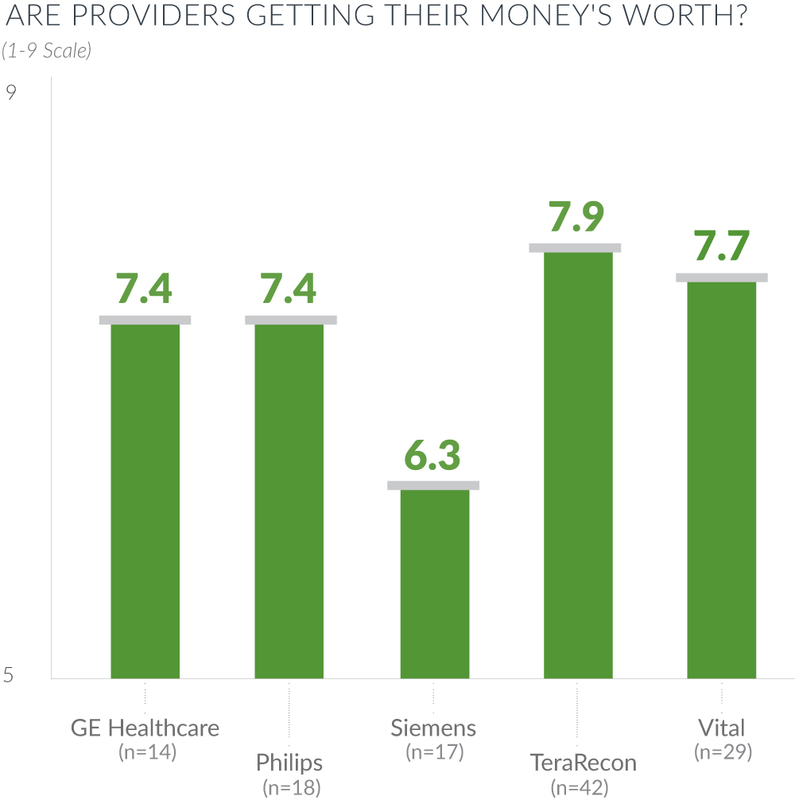 GE Healthcare customers have concerns about the vendor's tiered support and lack of personalized service. Siemens allows customers to opt out of training, a decision that is often made because of the high cost, and that results in a poorer user experience. Healthcare organizations continue to expand and deepen their use of advanced visualization (AV) software, and the majority find they must rely on multiple vendors’ products to get the job done. Though providers are whittling down the number of AV systems used within any one organization, consolidation onto one platform across all clinical areas is not yet a reality. This KLAS report targeted providers with a server-based, enterprise-wide approach to advanced visualization to discover the depth of use and functionality across the most common clinical areas, along with which vendors are being considered as providers expand their use of AV technology.